A Guatemalan villager nearly killed and crippled by gunfire owes his ability to walk without pain today to Prescott orthopedic surgeon Bertrand Kaper, the founder of Operation Walk Arizona, an affiliate of the international organization Operation Walk. In trips to Guatemala and Ecuador, Kaper and his team of doctors, nurses and other medical professionals provide free surgery to repair injuries and deformities to patients who could otherwise never afford such care. 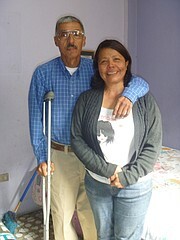 Patient Freddie, with his wife in Guatemala, through Operation Walk, is now walking again without pain. In the case of Freddie, the villager caught in the line of fire, bullets fractured his femur at his left hip joint and a local surgeon repaired the injury the best he could without the benefit of modern technology. Freddie’s hip, which still contained lead fragments, developed severe arthritis, and he was left with a leg that was three inches shorter than the other. “Freddie was actually developing systemic lead poisoning. He was so anemic that our internist said ‘We shouldn’t operate on this patient.’ I argued that we had to because if we didn’t, he was only going to get worse. Let’s just take a chance,” said Kaper, a surgeon with Orthopaedic Specialists of Central Arizona that has offices in Prescott and Scottsdale. Kaper performs surgery out of the Prescott Orthopedic Surgery Center and at HonorHealth Thompson Peak Medical Center in Scottsdale. The average Guatemalan’s annual income remains well below the cost of more modern surgery, making other medical options for Freddie, who could not walk, beyond his financial reach, Kaper said. Through his medical philanthropy, Kaper performed a surgery that removed the old hardware used to fix his fracture, removed the lead fragments, and implanted a hip replacement prosthesis to restore the joint and correct the length of his leg. “I can’t tell you how happy I am. I couldn’t walk, the pain was too much. Now it’s easy to sit,” Freddie said of Kaper’s intervention through an interpreter. Freddie’s story is an illustration of why Kaper is so committed to this mission. In seven years, Kaper has taken 12 week-long trips to Guatemala and four trips to Ecuador.